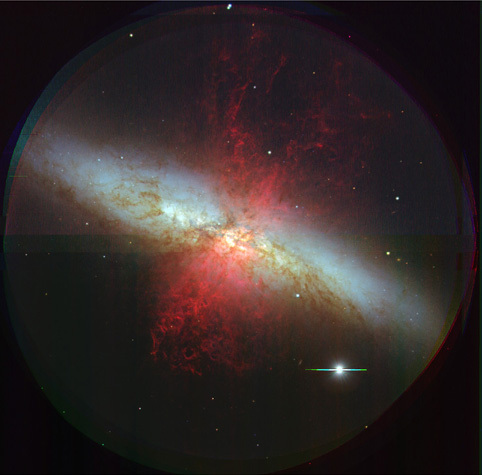 The bluish band seen running from the upper-left to the lower-right of the image is due to light from stars in the M82 galaxy, which is about 12 million light years from Earth. The red filamentary features extending perpendicular to the galaxy are due to ionized hydrogen gas emitting its characteristic red light (the so-called "H alpha" line) at a wavelength of 6563 Angstroms. 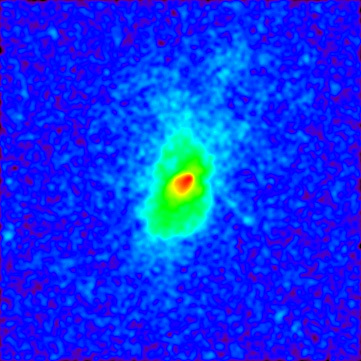 X-ray image of M82 in the 0.1-2.4 keV bandpass obtained with the ROSAT HRI. When matter is pulled toward a black hole, it is heated and produces X-rays. These X-rays create a radiation pressure which pushes out on the matter. If the matter continues to fall in, the radiation pressure of the X-rays must be less than the pull of the black hole's gravity. This effect, called the Eddington limit, enables astronomers to estimate the mass of a black hole.